This is not an aquatic worm but thrives very well on land in moist and loose soil condition. They are likely to be found under thick leaf litter with moist soil, and typically under shady areas. They earn their name for their ability to 'jump' when disturbed, confusing predators. The 'jumps' are actually very rapid flipping of its body, which they can use to escape quickly from danger. The Jumping Worm is one of the biggest earthworms and is an excellent bait for freshwater carnivorous fishes and also the Giant Freshwater Prawn. These worms are often driven out of their hiding during heavy rain(they can drown!) and sometimes gets washed into river where it becomes a tasty meal for the fish. Typical fishes includes Marble Goby, Snakeheads, Barbs and Cichlids love earthworms. You can easily keep this earthworm over several days or even rear them. They feed on dead plant matter in soil, just keep them in a container with loose, moist soil and cover the topsoil with leaf litter. Keep the container in a cool place and away from the sun. Do not pour water into the soil, sprinkle just a little water if you feel that the soil is too dry. 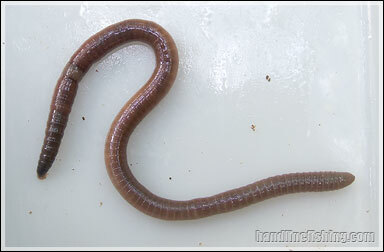 When using the whole earthworm as bait, you should use a long shank hook so that you can secure most part of the worm. Pierce the worm from its mouth and along into its body till it covers the hook entirely, hook tip and barb does not need to be exposed. It is important that you hook the worm from its head(instead of tail) because hooking from the wrong direction and the worm is likely to break apart. The head is easily identified by a pale white band near it.